Tom Nollette has written a very good, adventurous story in Brave Bradley’s Flying Adventure. It teaches that you can do what you really want to do if you are persistent, but do it responsibly. Bradley really enjoyed his life as a beaver, his family, and his friends, but something was missing. As he watches the birds flittering from branch to branch, he thinks how much he would like to fly. He decides to find out if someone would know how he might be able to fly. First he talks to Olli Owl, who suggests he talk to Pete the pilot. He sets out to find him and after a few days, he does. What happens to Bradley as he learns to fly is a great lesson about how to learn to fly. He learns about the airplane and what makes it fly and how to be safe when flying. He learns his lessons well and it is soon time for him to solo. Children will love reading about Bradley and his adventures in the air. Hopefully they will be inspired to follow their dreams as Bradley the Beaver did. Parents will be happy about the lessons taught about perseverance. Tom Nolette was a Marine jet pilot and a commercial pilot. He joined the Marines when he was a student at the University of Nebraska to pursue his dream of flying. After his military service, he pursued a career in business marketing and sales. He is married and has three grown children. 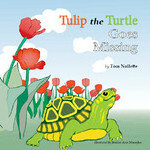 Tulip the Turtle Goes Missing by Tom Nolette is the story of a turtle found in the park by two young girls, Rosie and Ann. It had fallen from a rock ledge and landed on his back. Everyone knows a turtle has a lot of trouble turning itself back over after a fall like this. Rosie and Ann are no different. Rosie goes to help the turtle and decides to keep it. This story about the turtle in captivity is one that will help children to learn that wild things should stay in the wild. That is where they belong. When the Turtle, named Tulip by the girls, goes missing, they look for it. “…Tulip seems to have droplets of blood around both sides of the mouth. It looks like Tulip is hurt and bleeding. Rosie feels sad again. When they do find Tulip in the strawberry patch, Rosie makes a big decision to do what’s right for Tulip. The lesson learned by Rosie and Ann is one that will follow them throughout their whole life. The illustrations are bold and colorful matching the storyline so that children can follow it just by paging through looking at the pictures. Tom Nolette draws upon an early childhood experience for inspiration for this story. He grew up in a small western Nebraska town with trusting, loving parents who allowed early independence at an early age for all their children. He developed an adventurous spirit and love of nature as a very young child. He graduated from the University of Nebraska in 1972. He joined the U.S. Marine Corps to become a pilot.